There are a lot of Commander-related rules decisions that I honestly find a little odd. Why, for example, is Black Lotus on the “frowned-upon” list while Sol Ring is a staple that people are always telling each other to put in their decks? They are comparable in power level, and the only real reason Sol Ring isn’t considered part of the Power Nine is that it’s a lower rarity and stayed in the core set for Revised when the others left. But that’s all a different problem, because the fact is that the Ring is part of Commander, not to mention Vintage, Australian Highlander, kitchen tables I don’t even know about, and, as James correctly points out below, Kaladesh limited on an infrequent basis. There are few reasons not to play it in any of those locations, as it supercharges any deck’s early game (and often its midgame and lategame too!). It’s not perfect: in Vintage it can be susceptible to an early Null Rod or Ancient Grudge, and a deck that’s unusually heavy on colored mana in its costs can find two colorless mana a little awkward (granted, a little less so now that there’s no mana burn in conventional formats). It’s better in decks with higher mana curves than in low-to-the-ground aggro. But it’s very hard to overstate the advantage it provides. 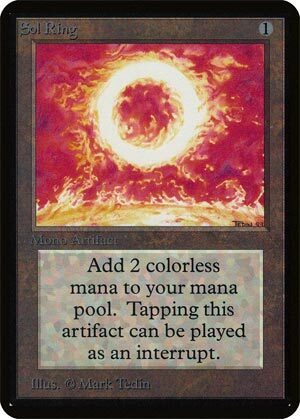 One of the original and iconic Magic mana rocks, Sol Ring is pretty much the one staple in every Commander deck, thanks to its legality. And, to be fair, it’s kinda busted, enabling a four-drop spell on turn 2. This is very powerful, of course, and there’s a reason Sol Ring is banned in every other format and restricted in Vintage; chaining Sol Rings together would be absurd. Sol Ring is maybe less powerful than the Moxen, but it’s still a staple where it is legal, and it’s near ubiquitous in Commander. And I’d like to say it shows up in Vintage; while costing 1 mana does make it clearly worse than the zero-drop rocks (by exposing it to the fair and reasonable Mental Misstep), it’s a massive jump in mana if you can untap with it.